Soak the bird’s nest in clean water for 2 h, changing the water several times during soaking. Water should be at room temperature. Remove any impurities. Rinse the bird’s nest a few times and drain the excess water. Boil some water in a double boiler or steamer. Rinse the dried longan before use. Add 250 mL of water, rock sugar and dried longan to the bird’s nest. 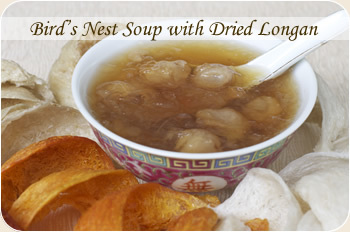 You need less sugar in this soup as the dried longan will sweeten the soup. Steam under low to medium fire for 45 minutes to an hour. Many Chinese believe that dried longan helps with relaxation and insomnia. Furthermore, dried longan nurtures the heart and spleen as well as promotes radiant skin complexion. 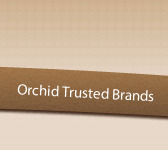 According to Chinese medicine, dried longan is considered “heaty” and hence needs to be taken in moderation. Add 250 mL of water, rock sugar and ginseng to the bird’s nest. The ginseng is added at the start of the cooking process to allow as much nutrients to be extracted into the soup. 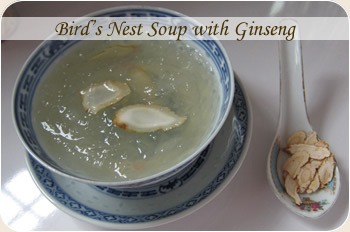 Ginseng lends more herbal flavour to the bird’s nest and provides further energy boost to tired mind and body. This soup tastes great when served hot. Add 200 - 250 mL of water, rock sugar and 1 pandan leaf to the bird’s nest. 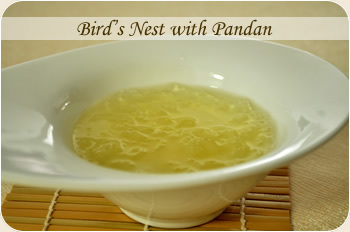 Pandan leaf enhances the natural smell of bird’s nest, especially the white nest. This soup tastes great when served hot or cold. This soup is also a hot favourite among children. For those busy professionals, start soaking the bird’s nest in the morning before you go to work and place it in the fridge. The bird’s nest is ready for cooking when you return home from work.